Want to see the most Instagrammed landmarks in Vancouver, BC in real life? Here's where to find them. Let's start with one of Vancouver's most colorful landmarks: the rainbow crosswalk on Davie Street, in the West End of Downtown Vancouver. Everyone loves a rainbow crosswalk, especially on Instagram. Davie Street is basically the epicenter for gay nightlife in Vancouver, is home to several gay-friendly hotels, and plays a major role in Vancouver's annual summer Pride festivities (including the famous Davie Street Block Party). Inukshuks are traditional waymarkers used by the Inuit people of Arctic Canada. A symbol of both the city of Vancouver and the Vancouver 2010 Winter Olympics, inukshuks are inherently photogenic. This is especially true for the inukshuk on English Bay, which is an Instagram star (though it is rarely named in the hashtag). The inukshuk on English Bay is the most famous inukshuk in Vancouver; it's located on the south-western coast of Downtown Vancouver, between English Bay Beach and Sunset Beach. This inukshuk was created by artisan Alvin Kanak of Rankin Inlet, Northwest Territories. Head here at sunset for epic views of English Bay. Where to find it: Along the Stanley Park Seawall, just north of Third Beach. It's easy to Instagram the hell out of Granville Island, which is likely why it's so popular. It's almost impossible to take a crappy picture here. There are the dramatic (and immediate) city views, gorgeous fresh foods and produce in the Granville Island Market, picturesque alleys, artisan shops, and the adorable Aquabus water ferry. Granville Island is located just south of Downtown Vancouver, under the Granville Street Bridge. You can get to Granville Island by bus, Aquabus (which will take you across False Creek from Yaletown), on foot/bike, or by car. Photographers and tourists just love the Gastown steam clock, and there are truly gorgeous images of this Vancouver landmark all over Instagram (though they're rarely hashtagged with the full name). Although Gastown itself is one of the oldest parts of Vancouver, this antique-looking clock was actually built in 1977; it is a working steam clock, though, that whistles every 15 minutes. Located in Jack Poole Plaza by the Vancouver Convention Centre on the Downtown Vancouver waterfront, this sculpture by Canadian artist Douglas Coupland is a favorite backdrop for Instagrammers, photographers, visual artists, and tourists. 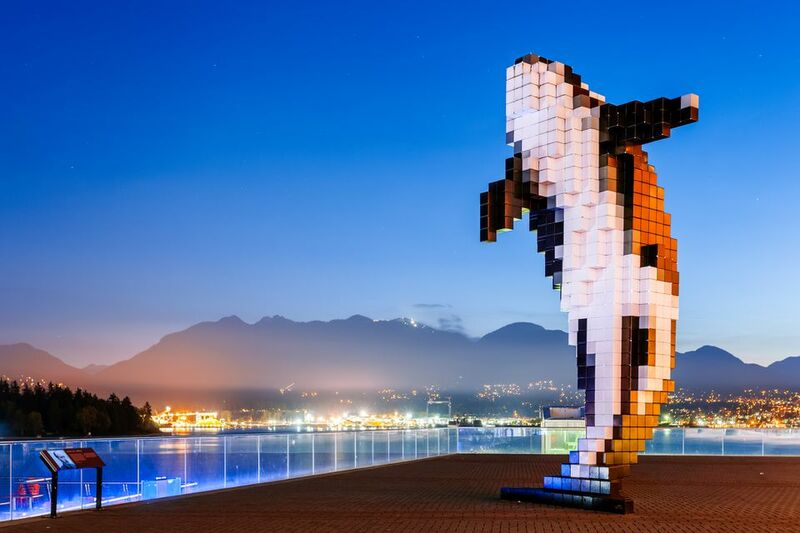 The glorious pixelated orca was created in 2009 "to commemorate the workers in and around Burrard Inlet and Coal Harbour." Grouse Mountain isn't just one of the most Instagrammed locations in Vancouver, it's one of the most Instagrammed locations in all of Canada! Located in North Vancouver, Grouse Mountain is the mountain resort closest to Downtown Vancouver--it's about 20 minutes north of the city. Grouse Mountain is an Instagram star for the incredible panoramic views at its top and along its famous Grouse Mountain Skyride (North America’s largest aerial tram system). May through September, Grouse Mountain offers a summer shuttle service from Downtown Vancouver: Grouse Mountain Shuttle. Lion's Gate Bridge, built in 1938, is the suspension bridge that connects the Downtown Vancouver peninsula to the North Shore (including parts of North Vancouver). There are two places to get really good views of the bridge: Stanley Park and Ambleside Park in West Vancouver. In Stanley Park, you can see (and photograph) the Lion's Gate Bridge from the northern Stanley Park Seawall (on foot/bike) or--if you're driving--from viewpoints around Prospect Point, the highest point in Stanley Park. (Most tours of Stanley Park include a stop at Prospect Point.) You can drive over the Lion's Gate Bridge by heading north on W Georgia Street in Downtown Vancouver and simply staying on that road (there are name changes as it passes through the park). West Vancouver's Ambleside Park offers wide views of the bridge, with Stanley Park in the background. It makes sense that photographers and visual artists would be drawn to extreme architectural structures, and the Capilano Suspension Bridge is definitely extreme. One of the Top 10 Attractions in Vancouver, this historic bridge was built in 1889 and is suspended 230 feet (70 meters) above the Capilano River, providing amazing views of the canyon below. Capilano Suspension Bridge Park includes the eponymous bridge as well as the (almost) equally dramatic Cliffwalk (another great venue for dramatic photos). Like Grouse Mountain, it's located in North Vancouver and offers a free shuttle service from Downtown Vancouver. This is the story of a joke (and/or art installation) that became so popular it morphed into...not a joke. Once upon a time, Mount Pleasant--a Vancouver neighborhood known for its hipster attitude--had a park (Guelph Park) where there was an art installation of a reclining man. In 2012, as a joke / art installation, local artist Viktor Briestensky put up a sign that looked exactly like "official" Vancouver park signs that named the park "Dude Chilling Park." Initially, the Vancouver Park Board removed the "Dude Chilling Park" sign, but local efforts--including a 1,500-person-signed petition--encouraged the Park Board to reconsider. The Board re-installed the sign as a permanent fixture in the park in 2014, where it has been Instagrammed ever since.